After months of training, preparation, analysis and 61 matches, we are left with two teams battling it out to take home the Sam Maguire Cup this Sunday. Can Dublin make it 3 in-a-row or can Mayo avenge last year’s final loss to win the All-Ireland for the 4th time in their history. Current champions Dublin have played 5 matches to reach this year’s final in Croke Park, averaging 2-21 scored and 0-12 against. Dublin’s path to the final has been relatively straight forward compared to their opponents’. Mayo have had to play 9 times, almost twice as many as the Dubs, with two matches going to replays and another two going to extra-time. On average, Mayo have scored 1-19 and conceded 1-13. Not having a tight and competitive match until the final could prove to be Dublin’s downfall, but on the flipside perhaps Mayo’s gruelling schedule will take a toll on them come September 17th. Who will benefit the most from their respective roads to the final? We will have to wait until Sunday to find out. It is expected that both teams will line out the as they were for their semi-finals with Diarmuid Connolly being the only exception. It speaks to the depth of Jim Gavin’s side to be able to have the ability to leave the likes of Connolly, Bernard Brogan and Michael Darragh McCauley off the starting 15 and still have plenty of firepower in the line-up. Although Mayo will not have the same strength in depth, this Mayo team is without a doubt one of the most talented they have produced, but will need to keep injuries to a minimum and discipline to a maximum to ensure their star players remain on the field. For Dublin, it is rather simple, play as you have been all year and you will have a great chance of walking away with Sam. 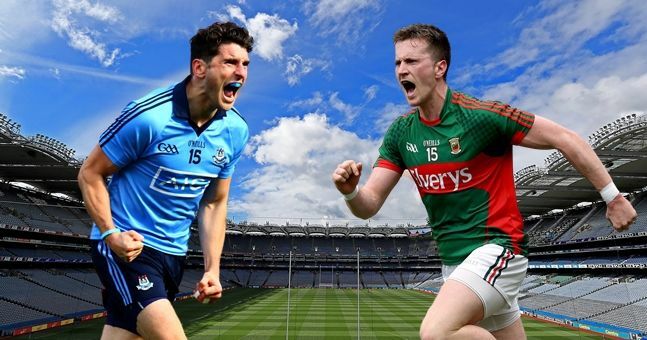 Some pundits have made reference to the fact that many of the young Dublin forwards have not faced the defensive pressure that Mayo can offer when kicking points, and this will be one of the keys paths to a potential Mayo victory. The Connacht team cannot afford to allow the Dublin forwards time on the ball, as they have seen what they are capable of time and time again throughout the year. Dublin scoring points is as predictable as the winning team ending up in Coppers, so although Mayo will have to keep Dublin’s points tally to a minimum, their forwards will have to be in top form and not let the game get away from them early on. Dublin are one win away from being called the greatest team to ever play the game, and it is going to take a monumental effort and performance from Mayo to prevent that from happening. The perennial second place finishers will not buy into any of the media hype leading up to the match, and will be confident they can finally get the job done come Sunday afternoon. Tune in at 3.30 pm to see which way it will go!